Can you relate to this? If it isn’t my mother making remarks about a “fix” needed in my home, it’s my spouse’s mother being passive-aggressive about my choice to fix something. Or, our coworkers will say nothing. No compliments… nothing. Of course, this bothers me almost as much as the Mother Ambushes. Here’s what I’ve learned: I did not need my mom to remind me over and over and over again that my entry door needed replacing. I knew it needed to be replaced. She was just doing her motherly thing and trying to mother me into keeping up with my responsibilities. Further, she worries about me. Chances were, she saw my worn-out door and feared the worse: a home invasion through my front door which would result in damage to my belongings and to her grandbabies. And, wouldn’t you know, she was right. I reached out to Brock that week and the next thing I knew, I was perusing door options and having questions answered. Costs and budgeting were easily navigated with my Brock professional. I felt confident. I felt excited. And, I couldn’t wait to show the “Moms” the new entry door. Of course, there are other comments we get about this or that throughout our home. My cooking is a regular target for passive-aggressiveness from my mother-in-law (she doesn’t like that I’m Vegan, or that her grandbabies are Vegan, too). But, the entry door—that is off limits. The Moms oohh-and-ahh over it. Even my dad patted my spouse on the back about his “fine choice” in door colour. The choice was mine, but that’s ok. I’ll take it. 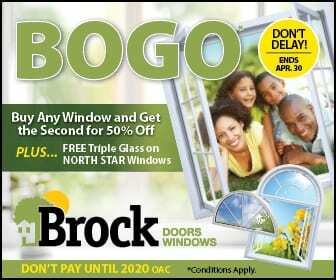 If your family is anything like mine and your Brampton entry door or windows could use an upgrade—be proactive. Get that entry door upgraded and replaced with Brock Doors and Windows. You’ll be glad you did.